istock; Jenny Cheng/Business InsiderEach iPhone contains 31 grams of aluminium. 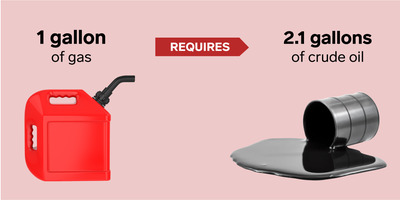 You’d be surprised by how much raw material goes into the everyday items you use. In our modern lives, it’s often easy to forget how many resources we’re using day to day, since most of us are far removed from the places and processes in which most foods and products are made. For that reason, we’ve compiled this list of how much raw material goes into 11 common food items and products. 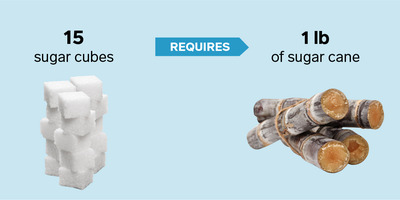 It takes around a pound of sugarcane, depending on the variety, to produce 15 sugar cubes. Sugar production is a global industry, spanning the planet’s tropical and subtropical regions. It’s labour-intensive process: Sugarcane, the plant sugar comes from, must be harvested – usually by hand – and then cut, mashed, and boiled to become sugar. Depending on the variety, one ton of sugarcane can yield between 170 and 225 pounds of refined sugar, according to Purdue University’s Center for New Crops and Plant Products. 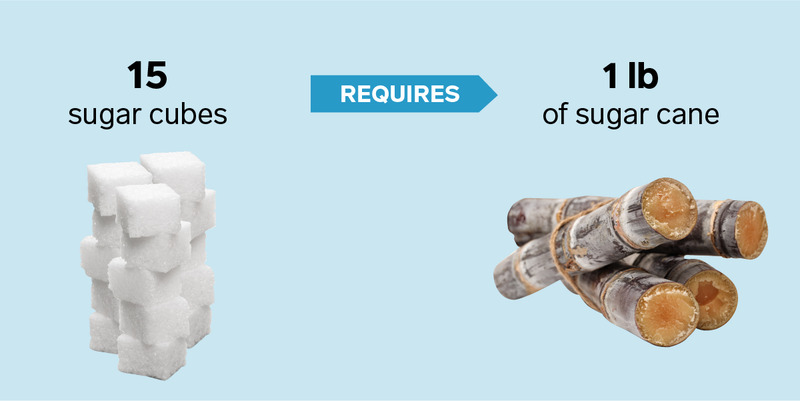 That means you’d need roughly one pound of sugarcane to make 15 3-gram sugar cubes, or around 3 ounces of raw sugarcane to make one sugar cube. Each iPhone contains 31 grams of aluminium. Your iPhone contains a number of metals, including titanium and iron. But there is far more aluminium, which is used to make your phone’s outer case, than any other metal. 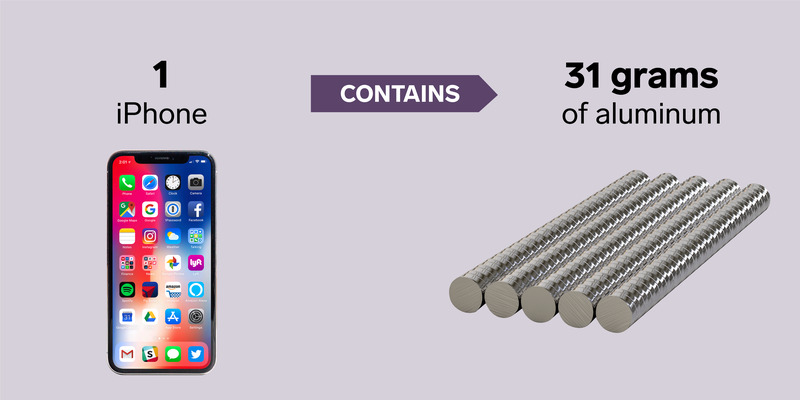 Aluminium comprises around 24% of an iPhone’s mass, followed by iron, which makes up around 14% of the device’s mass, according to Motherboard. The rest of the iPhone contains various rare earth elements and other metals like titanium, cobalt and nickel. 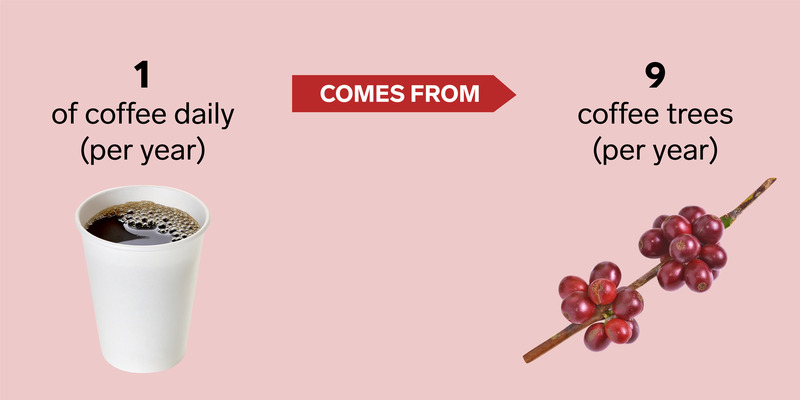 You’ll need the annual yield of nine coffee trees to give you one cup of coffee per day for a year. 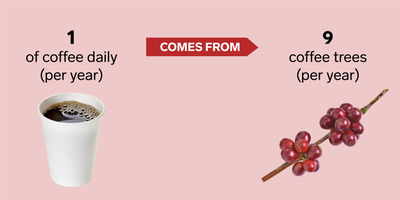 Here’s how this breaks down: An average cup of coffee uses around 100 coffee beans. A coffee tree can produce, on average, 4,000 coffee beans in a year, according to Treehugger. That means you’ll need at least nine trees to produce a year’s worth of coffee for a cup-per-day drinker. That’s not to mention the inputs required for coffee to grow, get roasted, or brew, nor the fact that it takes a coffee tree at least 5 years to reach full productivity. 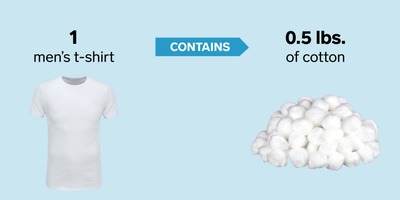 An average men’s t-shirt takes half a pound of cotton to make. Harvested cotton is gathered into bales, which weigh around 500 pounds. 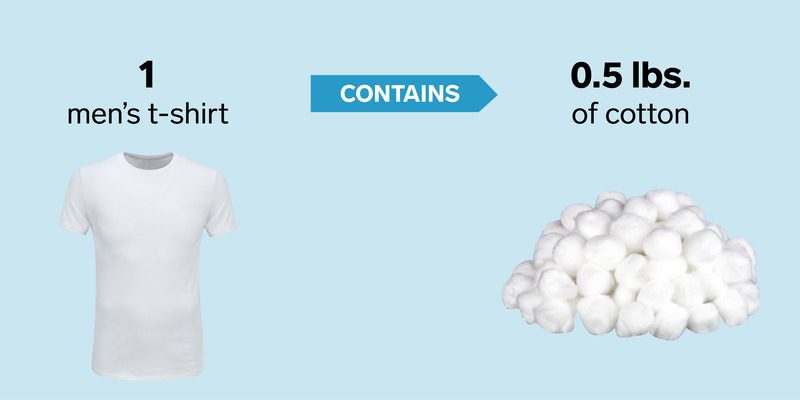 That’s enough to produce around 1,000 medium-sized men’s t-shirts, according to the National Cotton Council. Blue jeans, on the other hand, need around 1.5 pounds of cotton per pair. It takes two chickens an average of one week to lay a dozen eggs. 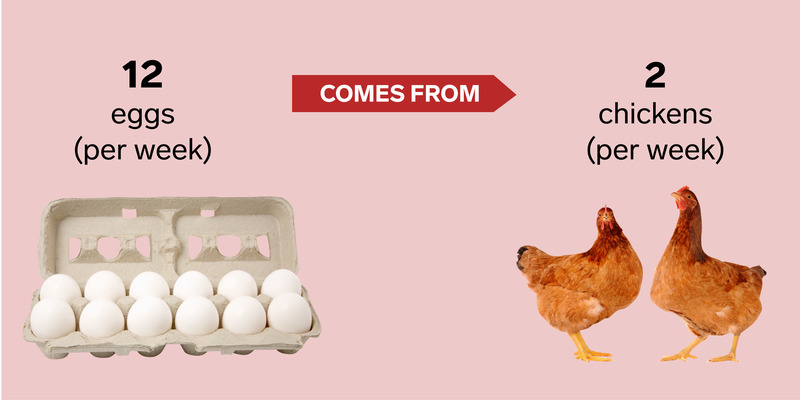 Depending on the breed, the average hen can lay four to six eggs in a week, for a total of around 200 eggs per year (everybody needs a day off). That means it takes two hens a week’s worth of work to produce a dozen eggs. 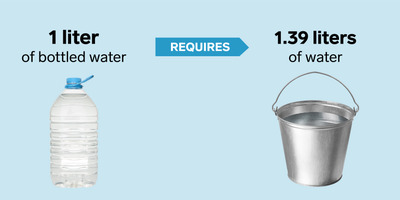 A litre of bottled water takes 1.39 litres of water to produce. To produce a litre of bottled water, companies that bottle water uses an average of 1.39 litres of fresh water, according to the International Bottled Water Association. The extra 0.39 litres is used for processing, which includes treatment, sanitation, and bottling. 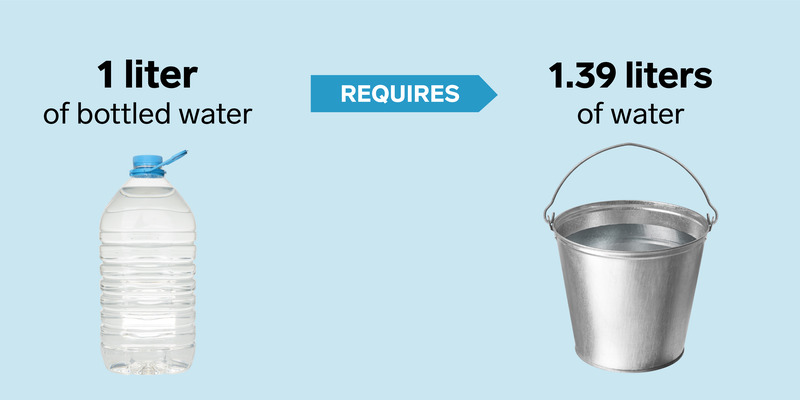 That number does not factor in the water used in the production of the plastic bottle. It takes 2.1 gallons of crude oil to generate a gallon of gasoline. Crude oil is produced and exported in barrels, which each contain 42 gallons of oil. That oil gets refined, a process that separates it into different components that are then turned into the products we use. After that process, each barrel produces around 20 gallons of the gasoline you’d find at your local gas station, according to the US Energy Information Administration. The rest of the oil gets processed into diesel fuel, jet fuel, and a range of other petroleum-based products like plastics. 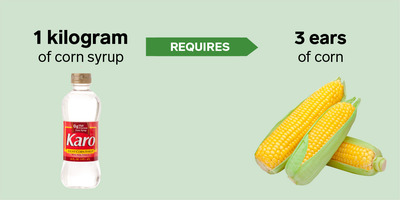 You’ll need three ears of corn to make a kilogram of corn syrup. Corn syrup, especially the high-fructose variety, is used as a sweetener in everything from Coke to salad dressing. To make the stuff, you need a lot of corn, which is one of the reasons corn is the US’ biggest agricultural crop. Corn is generally measured in 25-kilogram bushels. Each bushel yields around 15 kilograms – just over 33 pounds – of corn syrup, according to the US Department of Agriculture. Corn syrup is then either sold as is or processed into high-fructose corn syrup for use in soda and other products. You need about 12 oranges to make the average litre of orange juice. 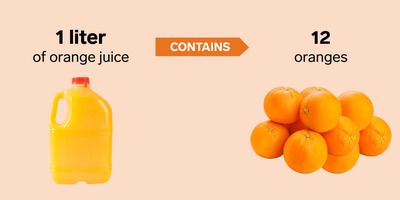 PepsiCo’s signature orange juice brand, Tropicana, uses about 12 oranges in each litre of orange juice. If you’re making orange juice at home, the general rule is about two to three oranges per cup. One loaf of bread requires just under a pound of wheat. 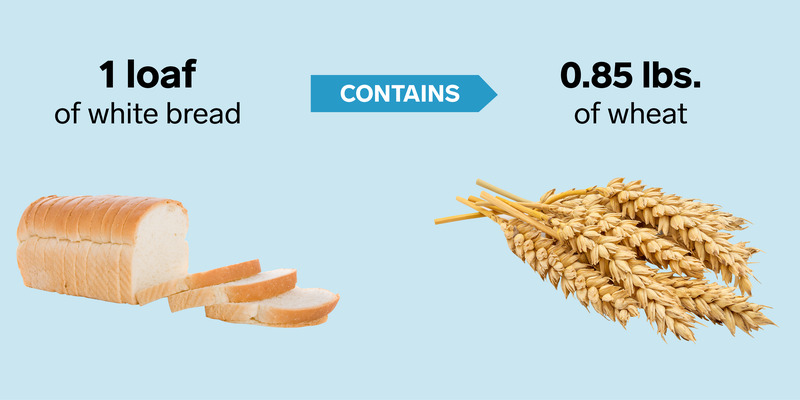 When wheat is harvested, it’s gathered into 60-pound bushels. According to the National Festival of Breads, one bushel can produce around 42 pounds of flour, which is enough to make around 70 loaves of white bread. You’ll need between one and two agave plants to make a handle of tequila. 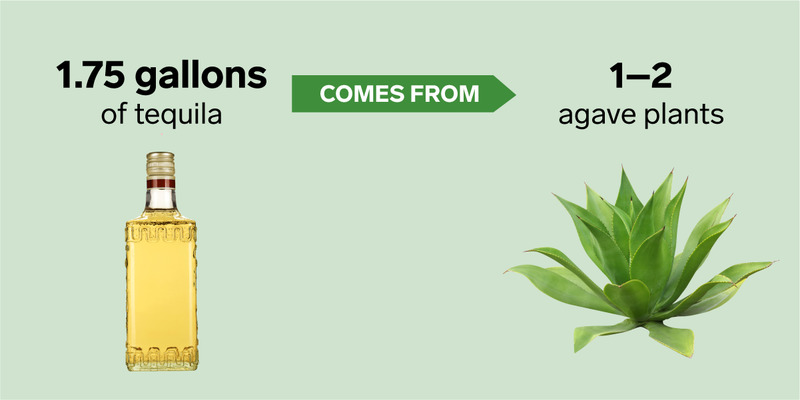 When agaves are harvested for tequila production, the heart, or piña, gets removed. The piñas are then roasted and crushed to produce the liquid that becomes tequila. They can weigh between 80 and 200 pounds when harvested. While tequila production isn’t an exact science, you need one to two agave plants to produce an average handle of the alcohol, according to a Quora thread from a tequila producer.